What better way to celebrate Easter than with the candy-colors of springtime? Think you're too old for an Easter basket? Think again! Order a lush basket of Easter flowers from VICKI'S FLORIST for yourself or any bunny who needs a little pick-me-up! Whether your style is bright and cheery gerbera dasies, or powdery pastel lilies, this Altoona florist has you covered! A mother's love knows no bounds. Show her just how much you care with a special Mother's Day flower delivery. VICKI'S FLORIST has the best selection of flowers and gifts for Mother's Day. Send a bouquet of her favorite flowers, or have your florist create something stylish to fit her personality! When it comes to flowers, the possibilities are endless. Come by the shop, give us a call, or click on any of the flower arrangements above to get started. Having a hard time deciding on the perfect gift for dad? VICKI'S FLORIST can help! Send dad a artistically crafted floral tribute to show him how much you care. Perhaps your dad is the type that would prefer a gift basket filled with his favorite snacks! Whether your dad lives in Altoona, or clear across the country, we've got you covered! Thanksgiving activities will soon be starting. Give the holiday recipe a dash of autumn color by sending flowers online or shop for Thanksgiving table decorations, creative centerpiece ideas, and more at your local Altoona flower shop, VICKI'S FLORIST! Brighten your Thanksgiving turkey dinner with unique floral arrangements, like a table centerpiece for the host, cornucopia fruit baskets, contemporary floral vases or baskets of fall flowers. Let your holiday florist, VICKI'S FLORIST in PA bring warm smiles from across the miles at this year's Thanksgiving celebration! Flowers never fail to bring a smile to someone's face. Who could use a smile more than your boss? VICKI'S FLORIST can help you choose a fantastic floral arrangement that's sure to make your boss turn that frown upside down. Who knows, maybe you'll get out of work a few minutes early? Tis the Season! Time to pull out the lights and put up the tree! At VICKI'S FLORIST, we specialize in all-things Christmas! With the trendiest Christmas accessories and ornaments, you are sure to find exactly what you need for your holiday decor at VICKI'S FLORIST in Altoona. Whether you're planning for a Christmas party or just decorating your home for the holiday, we've got you covered. From traditional, to playful and fun, you will find the Christmas decorations you need at VICKI'S FLORIST. Roses are always a great, classic way to say 'I love you' while a bouquet of your loved one's favorite flowers is always perfect on Valentines Day. Sending roses is always a special occasion. 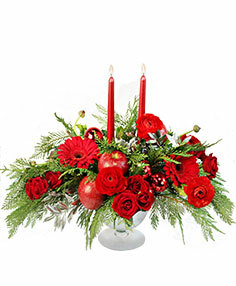 Let VICKI'S FLORIST help you send this traditional romantic gift. They are also one of the most popular and recognized flowers in the world. No matter who you want to send flowers to, roses are a perfect choice. Send red roses for romance, white roses for respect, and yellow roses for friendship. Whatever rose you choose to send, VICKI'S FLORIST in Altoona can help you!